Roger Dunsmore of Coeur d’Alene, Idaho just released a compilation of poems, On the Chinese Wall: New and Selected Poemes (1966-2017). Drumlummon Institute Press, 2018. Forget eating healthy, exercise, and whatever else the doctors say about how to hang on to your youth. I’m here to reveal the real secret to vitality and how to keep your youthful vigor: Poetry. Well, in any case, poetry seems to have worked for Roger Dunsmore, 80, of Coeur d’Alene. He looks like he’s in his 60s. Dunsmore probably eats healthy and exercises every day, too, but what he mainly does — and has done for more than half a century now—is write poetry. His latest book is called On the Chinese Wall: New and Selected Poems (1966-2018), and it will no doubt ascend to its proper place on the shelf of important Western literature in due course. It also happens to be a wonderful read — which many readers may find surprising for a poetry book. But there’s much about Roger and his work that is surprising. For starters, this book is as long as a novel and represents only a portion of the artist’s complete work. Dipping into it is like wandering into the Bob Marshall or the Frank Church Wilderness: once you enter, you stop feeling any sense of urgency, and you enjoy where you are. This makes sense, because one of its themes is the importance of our relationship with nature and nature’s role in our own mental health and our ability to connect with other people. That’s surprising also to find in a poetry book: most people would tend to think of poetry as a solitary experience. This book is more of a spiritual journey than anything else. It’s a man’s quest for connection, passing through the thought and culture of visionaries everywhere — from ancient Asia to the modern Blackfeet Reservation. The human connection in Dunsmore’s poetry probably stems directly from his many years as a teacher. He has taught all over the world: as a visiting scholar at Brescia in Owensboro (a school run by Ursuline nuns), a Humanities Scholar in Residence at a high school on the Navajo Reservation in Arizona, and an exchange fellow in China. But the bulk of his teaching took place in Montana, where he taught composition and humanities courses for 30 years in various programs. Dunsmore loved teaching — so much so that after he retired in 2003, he returned to the classroom in 2005 to teach at UM Western in Dillon, where he became enamored of the school’s innovative curriculum. “I liked the Block System at Dillon so much, and the work ethic and openness of the rural and small-town students, that I stayed there eight years, retiring yet again at 74,” he said. A good teacher was first a good student, and that probably also helps keep Dunsmore young: he has never stopped being a student of the world around him, and he continually thanks his mentors. Teaching and learning are related as yin and yang in Dunsmore’s world view, because both are intimately connected to what it means to be fully human. “I could not have done 50 years of teaching if it weren’t for the students pouring their hearts out in their own written work,” he noted. Part of what makes On the Chinese Wall so enjoyable is getting to meet some other well-known poets through Dunsmore’s eyes. We get to know the renowned Butte poet Ed Lahey, whom Dunsmore credits for teaching him about the importance of reading poetry both as performance and as a way of connecting with an audience. Ed tells of your persistence. / He nailed a piece of tin / over a hole in his roof. / You made another just above it. / Which he nailed over with a piece of tin. / You made another just above it. / Which he nailed over / and over; holes and tin / until you both run out of roof, / no heart to peck or nail the sky. Though Dunsmore is now in his eighth decade, his book of poems reads at times as if it were written by a young man, exuberant and striving for wisdom, in love with the richness of the world. Perhaps it isn’t just writing and teaching that has kept Dunsmore vibrant. 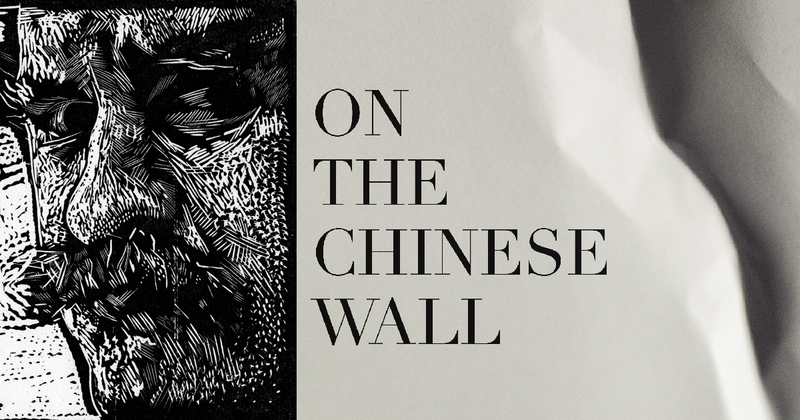 If you’ve been feeling run down or lethargic lately, instead of messing around with your diet or switching wines, try this: get a copy of On the Chinese Wall, take a walk into the local woods or a nearby park, and read a few poems.